Feeling somewhat punch drunk this morning after last night's Civic Society AGM. It was really busy and well attended and there was lots to see and do. Today (tonight actually) I shall try to pull it together into minutes of the AGM and then minutes of the ordinary meeting/social that followed. Our newly elected County Councillor made an appearance to meet us (and we him) and was asked some interesting questions by society members. Good night, but I was ready for my bed last night! Well I wrote that this morning and I haven't even started the minutes and unlikely to now!! Hey Ho maybe tomorrow. The day has been busy, mostly faffing around with mums and chicks. A surprise hatching as been from a hen we found hidden in the tree house last Sunday YGD had asked if we could play a ball game and I knew that I had put a large bucket of bats and balls into a small shed that is not easily accessible. Out the other end of this shed is a "secret" way into a tree house that is covered in ivy and damsons. Because it is not longer safe to use we have never mentioned it to YGD who is much younger than the other grandchildren. So she found out about it and was very excited that we had a "Secret Tree House". When we peeped in ( not safe to climb into) there was a black hen hunkered down in the far corner. So each day since then I have checked her out to see if all is well. Today when I looked the hen was on the ground in the small shed with two tiny chicks. Clearly the early hatchers had fallen out the tree and mother had followed. In the tree house there are 10 more (now cold) eggs. So two it is then ! The other hens with chicks have all ventured out today, so it has been chaos. The tally so far... 2 black hens with two chicks between them ! Two red hens with 5 chicks between them, Mummy Buff with 3 chicks and now Tree House Hen with two. There are still six hens sitting in various strange places in the two major houses. Watch this space !! One of the (still not too good) lambs has been scouring and because she hadn't been docked by the farmer we bough her from is in a very messy state. The main worry with this is that the flies are attracted to this and can lay eggs that hatch into maggots that literally eat the flesh. This condition is called Strike and is very distressing. So yesterday EGD and I bought her in and gave her a shower in the bathroom. I have been bringing them in at night because we have a fox problem, but last night I also put the heat lamp on to ensure that she dried. To be honest I put the heat lamp on tonight too, as the weather is so wet at the moment and they need all the help they can get. 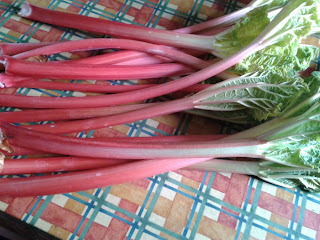 Here is a picture of some of my first (forced) rhubarb, this is lovely and pink and tender. I cover half of my rhubarb with compost bins as they start to push through the ground and the exclusion of light creates this lovely stuff, which is a different animal from the other rhubarb to come. I have sufficient to sell, so I shall put a sign out at the gate tomorrow. It all helps! Looks like the weather isn't too good this weekend. Still plenty I can to. There lots of pricking out to do in the green house . I need to do a bake (Adam is here and he loves to bake too) and I might even find some time for a bit of sewing. There is also an ENORMOUS pile of ironing, but I can't say I fancy that ! Bye for now Frugal Friends and thanks for reading my ramblings. 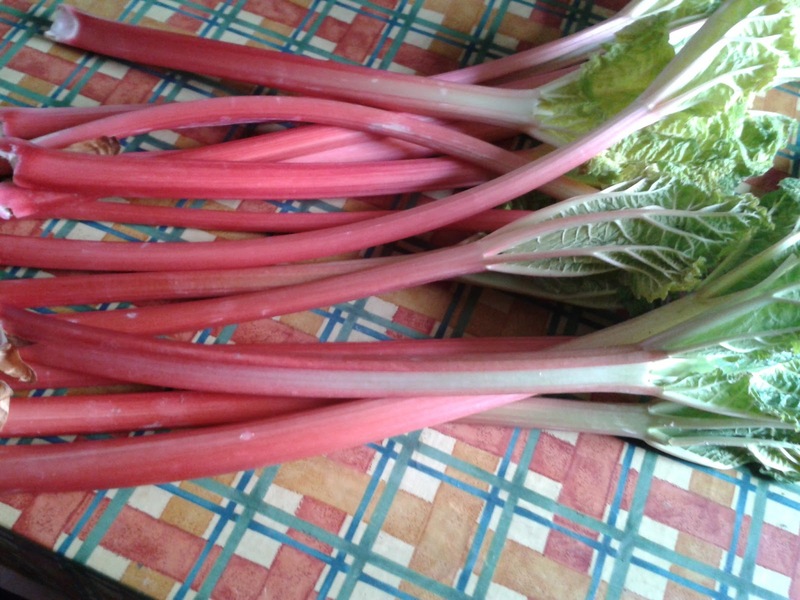 I've never made Rhubarb and Ginger jam. I once made Marrow and Ginger which was good. I shall see what the rest of the crop is like. Could be worth a try, thanks for the suggestion. Ey Up Me Duck !